U.S. stocks ended in the green as investors digested minutes detailing the deliberations from the Federal Open Market Committee’s latest meeting. The S&P 500 (^GSPC) ticked up 0.18%, or 4.94 points, as of market close. The Materials sector outperformed as gold reached its highest price in 10 months. The Dow (^DJI) rose 0.24%, or 63.12 points, while the Nasdaq (^IXIC) edge up 0.03%, or 2.3 points. The FOMC released minutes from its January meeting at 2 p.m. ET Wednesday. 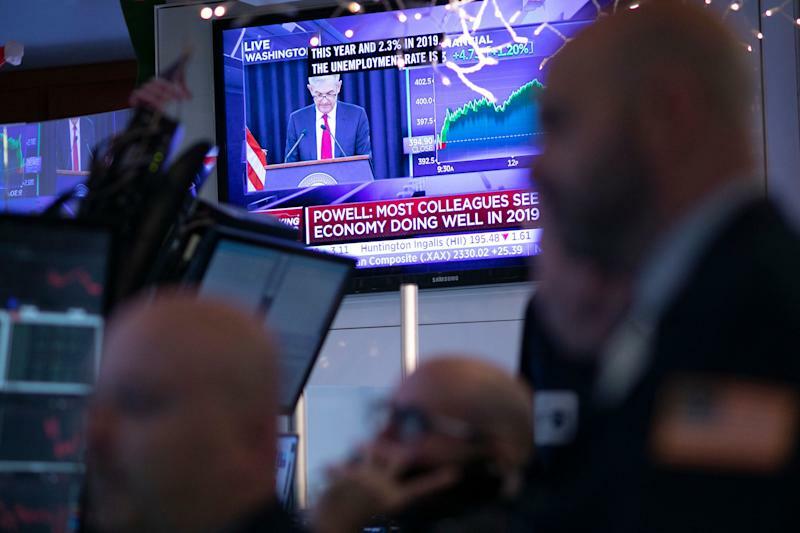 The S&P 500 and Dow each climbed to session highs in the minutes following the Fed’s release, with the Dow briefly jumping nearly 100 points before the major indices dipped into the red, then recuperated. Helping fuel the rise in equities were details pointing to central bankers’ commitment to flexibility in their balance sheet normalization process. This has been a central focus among investors as the Fed has continued to allow up to $50 billion worth of bonds and other assets to roll off its balance sheet without reinvestment, which has led to some concern over liquidity in financial markets and uncertainty over whether the Fed would be willing to adjust its policies if market conditions worsened. The sentiments reflected in the minutes, however, largely allayed fears of rigidity. “Almost all participants” supported announcing an end to the balance sheet normalization process this year, the minutes continued. Officials had originally believed that the balance sheet runoff could last as long as until 2023. The minutes also discussed that participants had pointed to “a variety of considerations that supported a patient approach to monetary policy” given current “risks and uncertainties in the outlook.” These provided further evidence of the Fed’s campaign of data-dependent policy, while highlighting some of the concerns central bankers carry for the economy. Namely, Fed officials’ “patient” posturing was informed by a deceleration in global economy growth and tighter financial conditions. Many market participants characterized Fed officials’ January decision and accompanying statements pointing to flexibility on their balance sheet unwinding process as a “pivot” from a previously more hawkish stance. However, others asserted that Fed officials have been open to changing their policy path for some time based on data, with investors misreading the latest decision as a reversal rather than the product of officials’ latest assessment of ongoing economic conditions. Themes of data dependence were telegraphed even in September following the Fed’s third rate hike of 2018, when Fed Chairman Jerome Powell said officials were “carefully monitoring incoming data from financial markets and from the economy” when making decisions. In the weeks leading up to the release of the minutes, Federal Reserve officials have underscored their patient approach to future policy decisions and reiterated their commitment to using data to make decisions. Federal Bank of Cleveland President Loretta Mester, said Tuesday that officials would consider medium-run forecasts “before making any further adjustments in the policy rate. Likewise, New York Fed President John Williams said in an interview with Reuters that he does not believe interest rates will need to be raised again unless new economic growth signals or inflation data justify such a move. The minutes come amid the February release of data reaffirming FOMC officials’ more patient stance. The closely watched core consumer price index – a key gauge of underlying inflation in the economy – released last week registered a 2.2% year-over-year rate of increase in January, close to the Fed’s 2% target. The latest producer price index reading also released last week registered a surprise decline, further suggesting contained inflation. Other data showed that U.S. manufacturing production slid the most in eight months in January, pointing to softness in some sectors. Elsewhere, earnings continue to stimulate financial markets. On Wednesday, CVS Health (CVS) beat expectations for quarterly earnings but missed on sales, and delivered an earnings outlook for the current quarter that fell short of Wall Street’s estimates. The prospect of negative first-quarter earnings have led many to call a “recession” on corporate profits, with concerns amplified during a time of softness in the global and domestic economy. Many analysts, however, assert that the pullback is much less dire, especially when considering the effect of results of more heavily weighted large-cap companies. Investors also continue to monitor the ongoing negotiations between the U.S. and China, as delegations from the two countries met in Washington, D.C., on Tuesday. President Donald Trump said on Tuesday that the talks were going well and suggested that March 1 – the date after which the rate of tariffs on Chinese-made products was set to increase – was not a “magical” date for negotiations to need to be completed. These remarks had sent equities higher Tuesday. Tesla (TSLA) shares declined on the heels of another executive departure and a Twitter post from CEO Elon Musk revising a projection for the car company’s full-year manufacturing numbers. Tesla general counsel Dane Butswinkas is leaving the company and will be replaced by Jonathan Chang, Tesla vice president of legal, effective Wednesday, the electric carmaker said in a statement. Butswinkas’ decision was due to a poor cultural fit and desire to return to his family and law practice in Washington, D.C., a source familiar with the situation told Yahoo Finance. Butswinski’s departure is the latest in a series of executive exits over the past year, with the company recently announcing CFO Deepak Ahuja’s retirement in January. Shares of Tesla fell 1% to $302.56 each. CVS (CVS) shares fell after the company delivered a weaker-than-expected outlook for 2019 amid rising costs and the ongoing integration of Aetna, which CVS acquired for $70 billion in a deal that closed in November. Fourth-quarter earnings per share were $2.14, ahead of the $2.08 per share expected by consensus analysts polled by Bloomberg, while net revenue also came in slightly ahead of expectations. CVS said it expects adjusted earnings of $1.49 to $1.53 per share in the first quarter of 2019, below the consensus estimate of $1.64. Full-year adjusted earnings are expected to be between $6.68 and $6.88 per share, below Wall Street estimates of $7.36 per share. Shares of CVS fell 8.1% to $64.22 each. Southwest Airlines (LUV) in a regulatory filing Wednesday lowered its outlook for growth in revenue per available seat mile, or RASM, for the current quarter. The budget airline now expects RASM, a key measure of airline efficiency, to increase 3% to 4% year-over-year for the quarter, down from the 4% to 5% growth seen previously. Southwest said in the filing that it expects negative revenue impact in the first quarter to be approximately $60 million, as “the company has continued to experience softness in passenger demand and bookings as a result of the government shutdown,” which lasted for more than a month between December and January. Southwest previously anticipated a negative revenue impact of between $10 million to $15 million. Shares of Southwest Airlines were down more than 5% to $54.41 each. Kandi Technologies (KNDI), a Chinese carmaker, said in a press release Wednesday that it received approval to import two of its models to the U.S., sending shares soaring to a 52-week high during intraday trading. The automaker’s Model EX3 and Model K22 have been approved for imports by the U.S. National Highway Traffic Safety Administration. Shares of Kandi Technologies surged 34% to $7.98 each on the Nasdaq. What Are Analysts Saying About Southwest Airlines Co.'s (NYSE:LUV) Long Term Outlook? What Should Investors Know About Ameren Corporation's (NYSE:AEE) Growth?